The Catholic Herald invited me to a Reception at the Friary in Westminster yesterday lunchtime to celebrate the visit of Pope Benedict XVI. I was keen to catch up with Luke Coppen, the Editor, as well as the other people on the paper. I did get to have a brief chat with Luke (above) as well as several of the other writers. It was a change to have a photo with someone who is the same height as myself! I was a little unprepared for what turned out to be a major Catholic social event. What made it such an electric occasion was that the Herald managed to get together people of such widely differing views to bump into each other over champagne and a finger buffet. Just to give you some flavour, this was the party at which Daphne McLeod met Oona Stannard while Princess Michael of Kent was nearby, graceful and charming, and Archbishop Nichols was meeting and greeting. 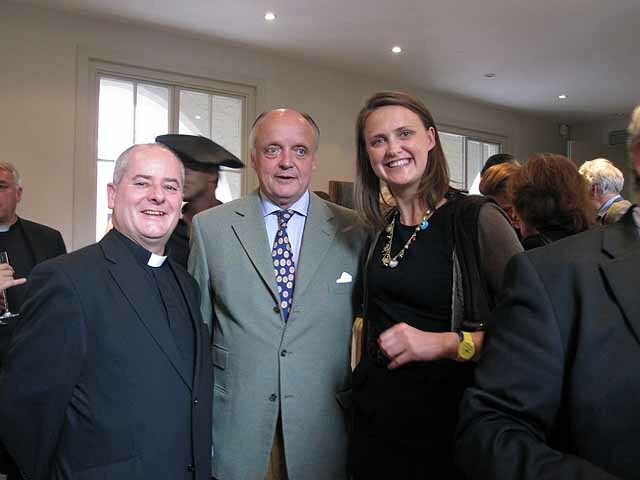 Sir Rocco Forte, the owner of the Catholic Herald was around, genially making jokes and banter. Brendan O'Neill, the editor of Spiked Online, claimed to be the only atheist there but he had plenty of friends given his articles in support of the Papal Visit. Many people chatted to me about yesterday's "The Pope's British Divisions" and I didn't even realise that Mark Dowd was in the other room - Mulier Fortis got a chance to chat to him. It was good to meet friends from Aid to the Church in Need, the CTS, and the Latin Mass Society. There are many others I haven't mentioned but quite honestly the reception left me rather dizzy. It wasn't just the champagne: I'm rather out of practice for events like this. The walls were decorated with fine pictures of Pope Benedict and Cardinal Newman and there was an atmosphere of mounting anticipation of the Holy Father's visit. He will make a difference to Catholic life in Britain and have an impact on our national life. Many thanks to the Catholic Herald for doing their bit both socially and in print to promote and support the visit.